Pepper weevil does not overwinter in New Jersey. Once established during the season, pepper weevil spreads quickly and is destructive to pepper crops in fields or greenhouses. Why do we care about pepper weevil? Pepper weevil are the most important pest of pepper in sub-tropical regions like Florida, Texas, Georgia, Arizona, New Mexico and Mexico. 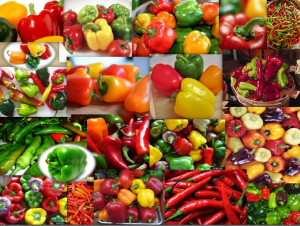 They are transported to NJ, spread to farms causing extensive damage, and are carried as far north as Canadian greenhouse pepper crops. Pepper weevil spends their lives inside the pepper damaging the core. A sign of their damage is the fruit and flower drop they cause. They are inaccessible and therefore difficult to control. In NJ, they have multiple lifecycles per season, about 21 days. There are multiple options for monitoring pepper weevil. 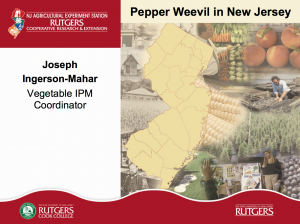 Please see the presentations below, and check the Rutgers Commercial Vegetable Production Recommendations for pepper weevil insecticide control recommendations. Contact your Cooperative Extension Ag Agent or crop advisor about monitoring, control, and preventing re-infestation.